Luminous, brilliant, intrinsically individual and extremely durable, the allure of diamonds is unique. They have endured the test of time, persisting through the constant evolution of fashion and style. 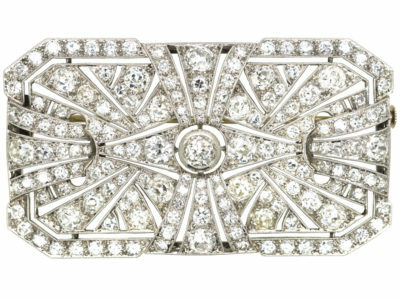 Here is our guide to the refined, exciting world of antique diamonds. Today diamonds are widely available from mines around the world and with a little help from modern technology, but in the past diamonds were extremely rare and highly coveted gemstones. Far from being inferior to the flawless, expensive diamonds of today, old cut diamonds are highly desirable and collectable. 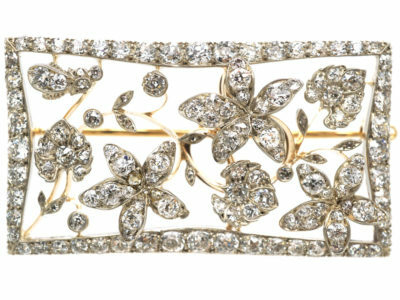 For centuries, diamonds have represented power and wealth – the ultimate status symbol. 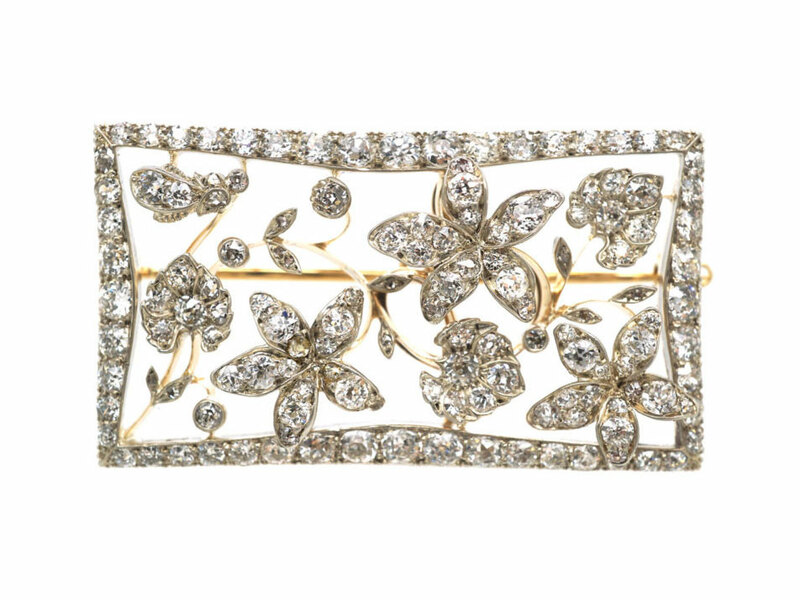 Antique diamonds were used by highly accomplished craftsmen to make intricate, bespoke pieces of jewellery for the royalty and noblemen of their time. Where modern jewellery is cast, antique jewellery is always handmade (even the more recent pieces are hand-finished, at the very least). It’s very difficult to find the same level of quality and workmanship amongst modern jewellery as we see in antique jewellery. 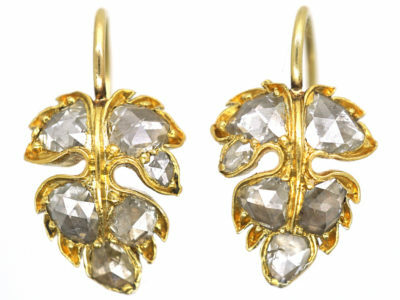 Gemstone diamonds are by nature unique. No two stones are the same. In a world of mass production this is a rare and lovely quality. 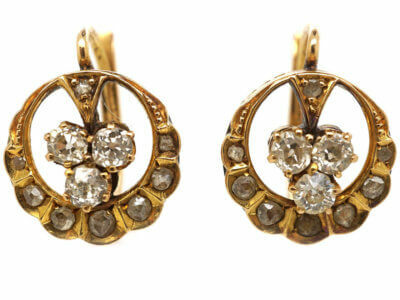 What’s more, while antique jewellery is often imitated from other eras, it was very rarely duplicated. 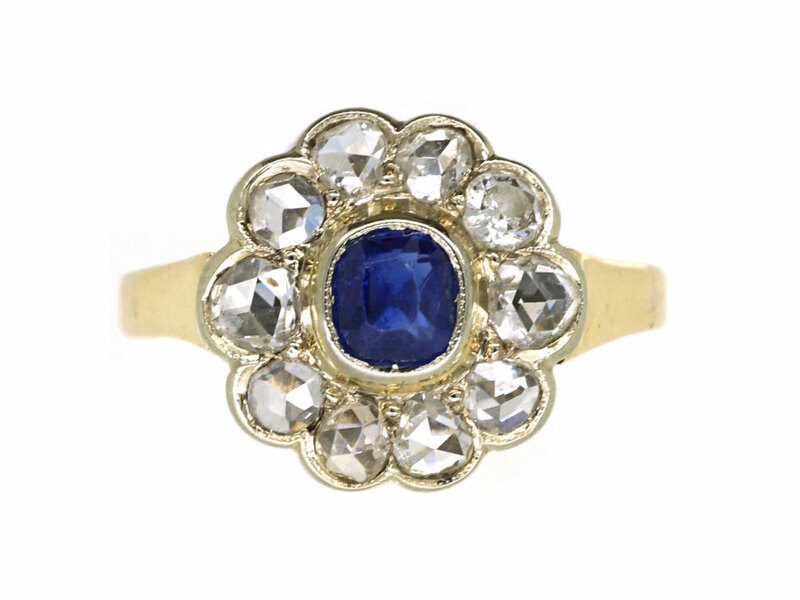 This means that buying antique jewellery offers the opportunity to own something completely individual. 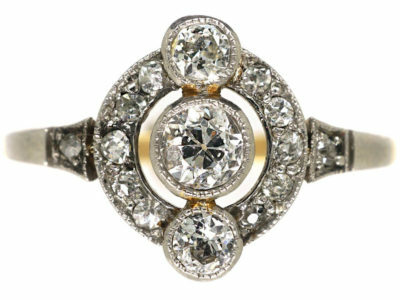 Retaining all the dazzle, durability and desirability of the modern diamond, antique diamonds have the added appeal of being much more ethical – buying antique diamonds makes you a conserver rather than a consumer. In a market recently darkened by ‘blood diamond’ controversy, this is a big plus. 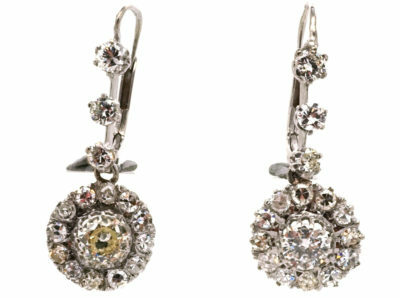 For the 2,500 years leading up to the 1700s, diamonds were primarily sourced in India and were extremely rare. 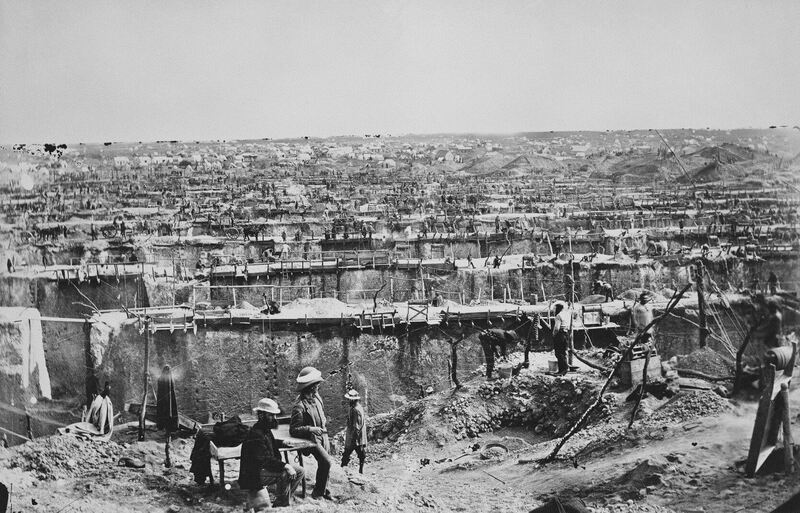 While diamonds remained very rare, mines were discovered in Brazil, and Latin America dominated the market until diamond mines were discovered in South Africa in 1866. De Beers bought up the new South African mines and restricted the supply of diamonds in order to keep demand and cost high. In this time, diamond mining was heavily influenced by civil war in Africa, producing controversial ‘blood diamonds’ or ‘conflict diamonds’. Nowadays, diamonds can be sourced in Australia, Botswana, Russia, Congo Republic, India, Brazil and South Africa, to name a few countries. 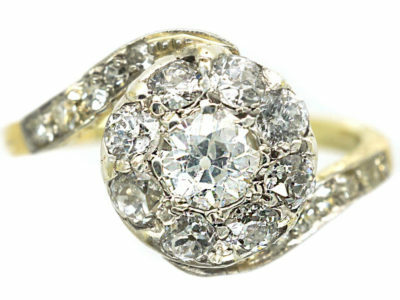 Antique diamonds offer extremely good value for money compared with modern diamonds. With no manufacturing costs to factor in, you can buy beautiful, high quality diamonds for a fraction of the price. With mines around the world and advances in modern technology, modern diamonds are widely produced. As a result, a smaller diamond with better clarity will sell for more than one with a pique (black inclusion) in it because flawless diamonds hold greater value than large diamonds in the modern market. 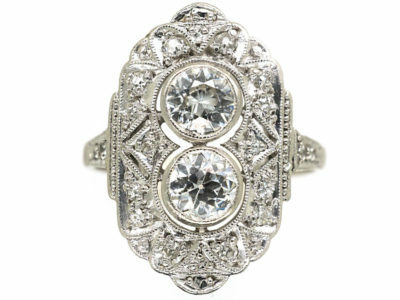 Antique diamonds were extremely rare in their day. This meant that they were valued by carat (weight), so it’s common to find larger, imperfect diamonds in fine antique jewellery. It also meant that craftsmen worked with what they had. 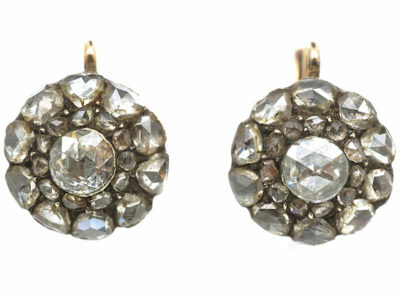 You often find diamonds in different colours but well matched in size and shape, in the same piece of antique jewellery. 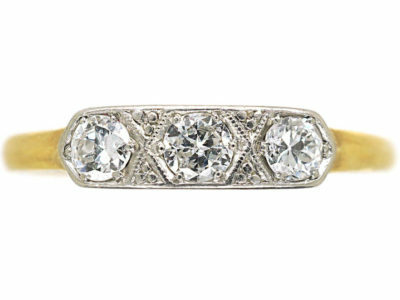 Antique diamonds are generally rarer than modern diamonds, which adds to their desirability and value. While technically based on opinion unless the stones are assessed ‘loose’ (i.e. outside of their setting), antique diamonds are graded using the same system as modern diamond grading – the ‘4 Cs’: Cut, Colour, Clarity and Carat. 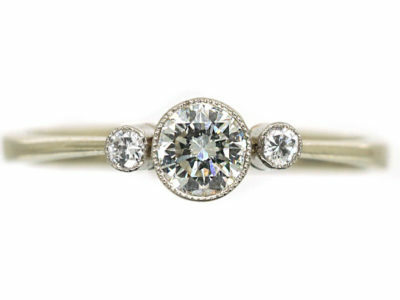 However, with antique diamonds you need to look for different traits to modern diamonds. The cut refers to the how the light interacts with the stone’s symmetry, proportions and polish. The shape of the stone is the outline of the stone – e.g. heart, round, marquise. The process of cutting a stone was intricate and required real skill. 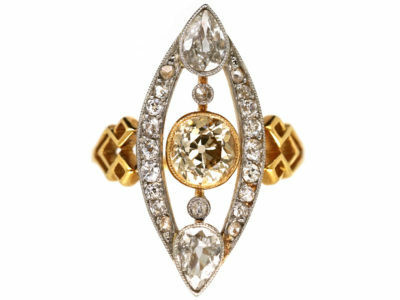 Antique diamonds were hand-cut by master artisans, unlike the laser-cutting of today. Used since the 1600s, this beautiful, ‘flat’ cut worked with the natural shape of the stones and produced a demure, alluring sparkle. Advancements in jewellery making resulted in a deeper pavilion (base) below the facets, which allow for a greater play of light within the diamond and a more brilliant sparkle. The invention of the diamond-cutting wheel allowed for a perfectly round stone, opening up the diamond to even more light, creating even more sparkle and a wider array of patterns. Formed naturally in the Earth, diamonds have blemishes (external flaws) and inclusions (internal flaws) within them. Clarity is assessed under a [microscope?] by an expert. Flawless diamonds are incredibly rare and expensive. A diamond which is ‘eye-clean’ – Slightly Included – usually offers the best value, but it’s worth considering that even an SI stone can only be identified under 10x magnification. 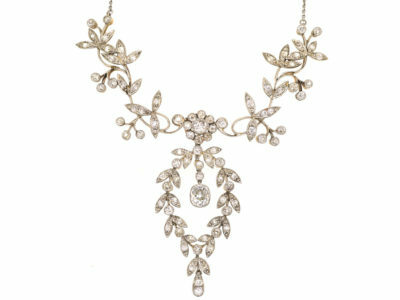 Truly white (colourless) diamonds are extremely rare and therefore expensive. 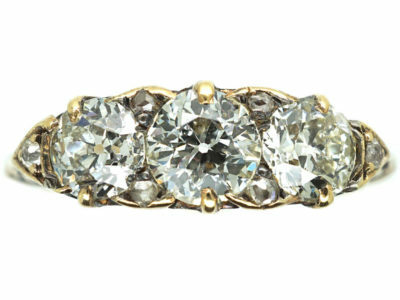 Antique diamonds usually have some colour in them, considered by many to add character and beauty to the stone. Keep in mind that an antique diamond’s true colour can be affected by cutting techniques and when buying it’s important to consider the piece of jewellery as a whole and look for stones you love rather than dismiss them due to their grading. A carat is a measurement of weight equal to 0.20 grams. 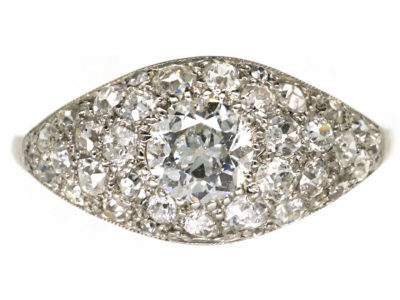 Bigger diamonds are rarer than small diamonds and this is typically reflected in the price of antique diamonds. However, diamonds can do what is known as “facing up larger”, which means that looking at a stone straight on gives the illusion of a larger one. The price of antique diamond jewellery is influenced by factors other than the grading system described above. The other materials used in a piece of jewellery will have an impact, as will rarity, craftsmanship, construction techniques, hallmarks, signatures and cultural context. While there are no manufacturing costs, a dealer’s overheads (the cost of running retail stores, for example, particularly in exclusive areas) have a big impact on price. Reputable online dealers or those without a ‘shop front’ are a good bet, particularly if you are able to see the collection in person or return jewellery free of charge. When buying antique diamonds, take your time. Look around to identify the styles you are drawn to and understand the appropriate costs. These days, copies of antique jewellery are sophisticated and difficult to identify. It’s essential to buy from an expert who will not only have the experience to distinguish an antique from a reproduction, but also the resources to check and double check with fellow experts before they buy. 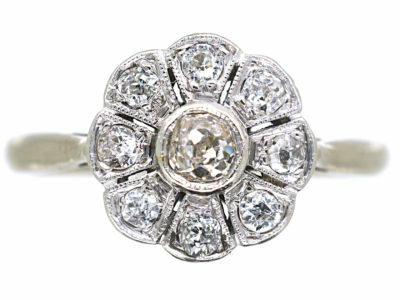 A common mistake made with reproductions is a Rose Cut diamond with only three facets. 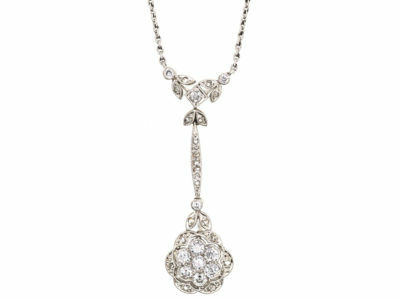 Original Rose diamonds were design to look like a multi-faceted rose and give a refined ‘grey’ sparkle. 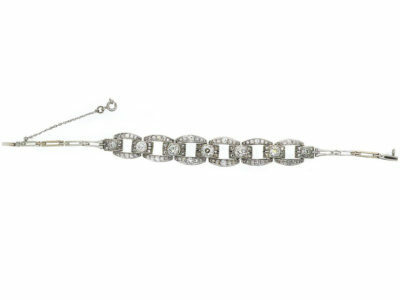 Antique jewellery will (and should) show signs of wear and tear. If it looks brand new, chances are it is. On the other hand, craftsmanship in eras gone by was of very high quality and this is evident in the finishing. Spotting all these signs requires experience. 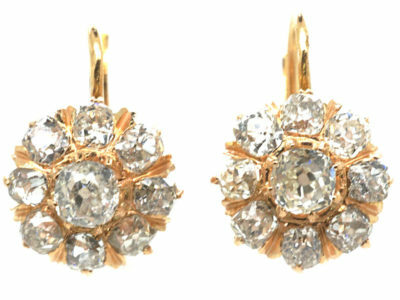 The best way to keep antique diamonds clean is to buy a jewellery dip from a reputable brand (Town Talk, Connoisseurs or Jewel Sparkle Jewellery Cleaner are all good). Simply put your ring in the dip for a minute and use a very soft, clean toothbrush to brush the stones. Dry with a soft cotton cloth or let it air dry. You can also use home products – dishwashing soap, shampoo or body wash will do – mixed with very warm water. Leave the stones in the solution for 20-40 minutes and then brush and dry as above. 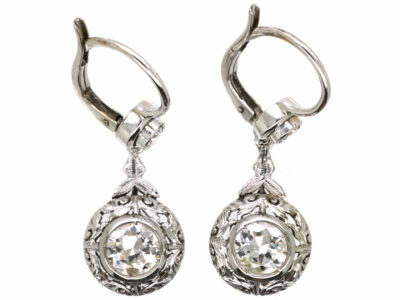 It’s important to avoid any products that are moisturizing – diamonds attract grease and the product will leave a film. 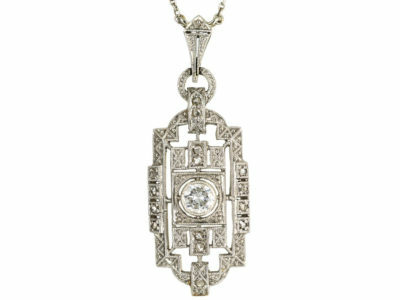 Diamonds commemorate the 10th and 60th (65th in some cultures) wedding anniversaries. 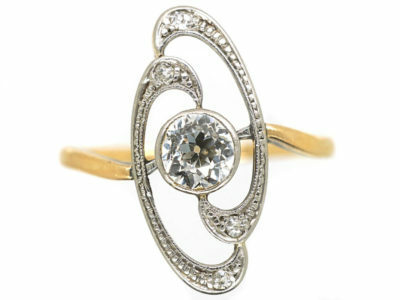 The Ancient Greeks revered the indestructible diamond and believed it to have mystical powers. Diamonds are between 1 billion and 3.5 billion years old. Diamonds are not made from coal, as is sometimes believed, but carbons atoms deep within the Earth. They are the hardest material known to man and can only be cut by another diamond. They repel water and attract grease. 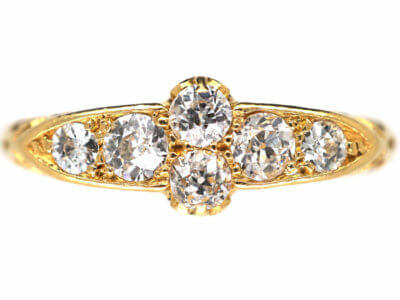 Diamond engagement rings have been traced all the way back to 1477 when the Austrian Archduke Maximilian proposed to Mary of Burgundy with a diamond ring. 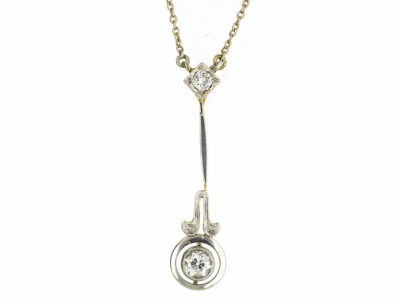 Olly Gerrish, founder of the Antique Jewellery Company, has been buying antique jewellery and diamonds for 40 years. An expert in her field, her team is made up of fellow experts (the AJC’s repairer used to work for the Queen!) and a gemologist. 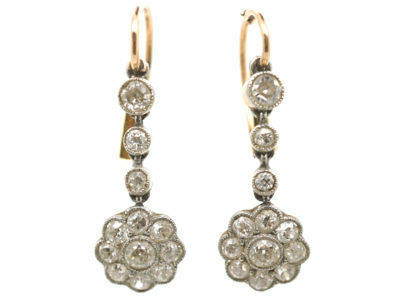 Diamonds feature in the Antique Jewellery Company collections across the eras and you will find them in a wide range of stunning styles, shapes and colours. 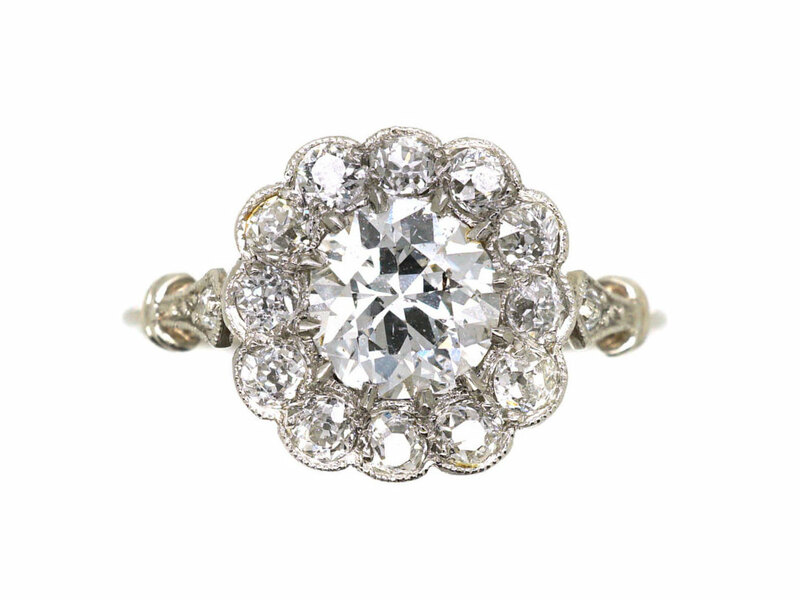 Browse our website to see our beautiful antique diamonds, or come and visit us in our Maddox Street showroom, in London.